After working in a veterinary clinic for the past five summers, Bailey Gray, a third year student in the College of Veterinary Medicine, decided she wanted to stay in Ames for the summer. And based on advice from a fellow CVM student, Bailey decided to try her hands at research as part of the college’s annual Summer Scholars Research Program. For Bailey, her research project focused on Johne’s Disease, a contagious, chronic and sometimes fatal infection that primarily affects the small intestine of ruminants. The project was directed by Dr. Jesse Hostetter, associate professor of veterinary pathology. Bailey was somewhat familiar with the disease after learning about it in one of her veterinary pathology classes. But her knowledge of Johne’s disease was limited to discussions held previously in one of her veterinary pathology courses. Johne’s Disease is a chronic ailment that is economically devastating to the dairy industry. Currently it is impossible to determine if calves have contracted the parasite, which infects their intestinal tract of the animal, making it impossible for the animal to gain weight. 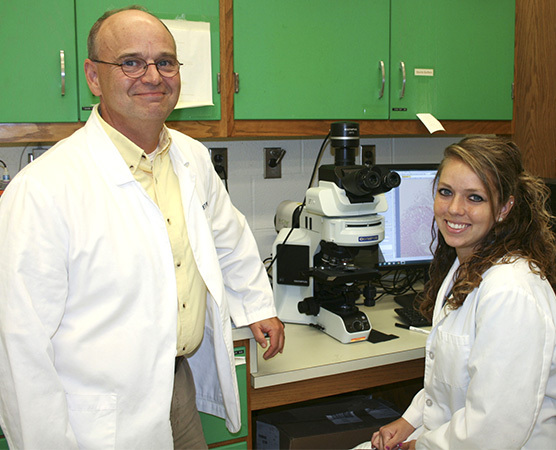 Bailey’s research study concentrated its efforts on determining why the disease occurs in cattle from ages two to five. The study required her to do some work in the research lab, something she hadn’t done previously.